Rebecca Randall is one of seven children, and her widowed mother Aurelia is having a hard time providing for them all. Aurelia is very relieved therefore when her sisters Mirandy and Jane offer to take one of the older girls off her hands. She cannot send the eldest, Hannah, because Hannah is too useful around the house, but she does decide to send Rebecca. Which is why Rebecca is now sitting next to the driver of a stage that is taking her to her aunts' house. The driver of the stage, Mr. Cobb, soon realizes that the little ten-year old girl is not at all like any child he has ever met before. She says the most extraordinary things, and though she is not pretty in the traditional sense, her eyes certainly have a look in them that is quite overwhelming. Unfortunately, Rebecca's aunt Mirandy is not as taken with Rebecca as Mr. Cobb was. She bemoans the fact the Rebecca is like her father, a man whom Mirandy disliked a great deal. She complains about Rebecca's odd ways and her inability to do everything that Mirandy expects of her. Poor Rebecca does her best, and yet her aunt is never happy with her. Thankfully Rebecca's Aunt Jane is a kindly soul, and she does her best to comfort Rebecca during the hard times. It is not long before Rebecca becomes one of the most liked people in the village. Her funny ways and kind heart win everyone over - except Aunt Mirandy. One day she makes friends with a kind man whom she calls Mr. Aladdin. His real name is Adam Ladd and he is so taken by Rebecca that he makes a particular point of looking out for her as much as he can. Rebecca knows that her family really needs her to get an education so that she can get a job and help pay off the mortgage, and she works hard to do well in school. Once she completes her studies in the little village school, she goes on to become a boarding student at a school in Wareham. She decides to finish the four year course in three years so that she can help ease her family's financial woes as soon as possible. 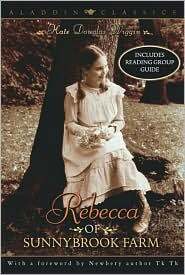 Rebecca does well at Wareham and makes some very good friends there, but the situation at Sunnybrook Farm gets steadily worse and this gives the vivacious young girl great cause for concern. Will Rebecca be able to help her family before they loose the farm? First published in 1903, this delightful story has stood the test of time admirably. The language is clearly from another era, but it is beautiful and wonderfully descriptive. Readers will find it hard not to smile at the author's clever use of understatement, and her interesting way with words will delight the ear. This is one of those classic books that is full of deliciously colorful characters, many of whom remind us of people who we know.